We have 3 cows. Nice girls. 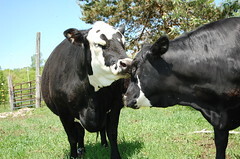 Each year we use the AI Guy to inseminate them — it’s cheaper than keeping a bull year round. We’ve been breeding them for 3 years now and all we ever get are boys. Betty is a nice girl, Angus. 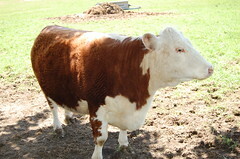 She was the first to calf, although by the calendar, she was #2. She had a boy on Wednesday. Here’s Beulah. That same Wednesday Gary was sure she would calf. 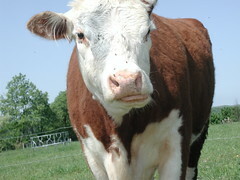 Last year she had a difficult time, had the calf pulled out of her, and ended up abandoning him. Turned out Wednesday was not her day. Today was her day. She quickly popped this one out in the pouring rain. A girl ! Our first heifer! She was up and running around in no time, maybe to shake off the rain. J.W. is next to go. Day on the calendar is tomorrow. Cows don’t read calendars, but tomorrow would be pretty convenient. Hear that JW? 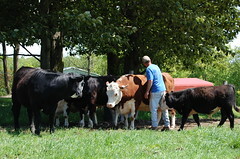 Partly sunny Sunday, temps in the low 70s – a perfect day to have a calf, no matter if it is a boy or a girl! Posted in Cattle, FRL Diary Entry. Tagged with cattle calf.